The BID, in partnership with Mt. Airy Business Association (MABA), West Mt. Airy Neighbors (WMAN), East Mt. Airy Neighbors (EMAN), and interested merchants and residents made great strides towards making more parking available in the business district. 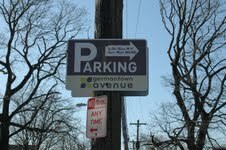 Thanks to the BID’s partners at Valley Green Bank, Germantown Home, and Fit Life, additional parking is available to the public after 6 PM and on weekends. The BID is the first in the City to use rain barrels to collect rain water to water the hanging baskets and tress wells. The BID collaborated with local artists and the Mt. 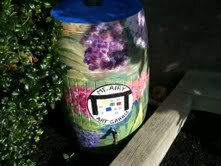 Airy Arts Garage to have the rain barrels painted to add art to the Avenue. The BID is maintaining pedestrian benches along Germantown Avenue that were installed by Mt. Airy USA. In partnership with Mt. Airy USA, $140,000 was granted by the City to provide 50 Big Belly Solar Powered trash and recycling receptacles along Germantown Avenue. 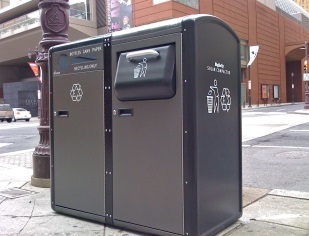 The receptacles feature a solar powered compactor, which prevents flyaway trash and reduces the number of collections needed. Through the PHS Landcare program, the BID maintains vacant lots in east and west Mt. Airy.